Posted on Thu, Jan 19, 2012 : 5:59 a.m.
Michigan hockey coach Red Berenson shuffled his offensive lines at the beginning of the season to determine which combination of forwards would have the best on-ice chemistry. In a weekend sweep of CCHA-leader Ohio State, the line of Chris Brown, Alex Guptill and David Wohlberg accounted for four of the eight Michigan goals and combined for 11 points. No other combination of three players accounted for more than six points in the two wins over the Buckeyes. It’s safe to say Berenson won’t be re-shuffling the lines again any time soon. “We’ve kept our lines together pretty consistent since our team got consistent,” Berenson said. Michigan has gone nine games without a loss (7-0-2) and beaten two top-5 teams in that span. A two-game series at No. 6 Notre Dame is up next, with games at 7:35 p.m. Friday (NBC Sports Network) and 7:35 p.m. Saturday (CBS Sports Network) at the Compton Family Ice Arena. 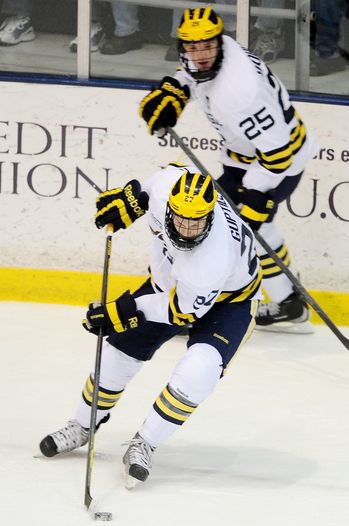 Michigan freshman Alex Guptill, front, and senior David Wohlberg, back, have joined junior Chris Brown to form a high-scoring first line for the Wolverines. Combined, they've scored 32 goals. Guptill, Wohlberg and Brown have scored 12, 11 and nine goals, respectively, this season, but it’s not just the allure of having the team’s top three offensive weapons on the ice together that’s attractive to Berenson. He said he likes the chemistry of the other lines, too, even though scoring might not be the immediate result. “Everyone’s talking about Wohlberg, but ever since we put Luke Glendening with A.J. (Treias) and Phillip (Di Giuseppe), that’s a much better two-way line than it was before,” Berenson said. The top line's ability to produce is of primary importance for the other lines to be successful. Brown and Wohlberg’s production is to be expected. A senior, Wohlberg was the team's top returning goal-scorer and Brown, a junior, was third. That Guptill, a freshman, is making such significant contributions already, however, has been unexpected. ... Sort of. “I just did the work that I thought I needed to do to be successful and come in and contribute right way,” said Guptill. “I mean, I wasn’t expecting, obviously, to lead the team in goals, but I definitely had high hopes to come in and contribute." And while overworking freshmen may be a concern in some sports, that shouldn’t be the case with Guptill, who, like most college hockey players, has a few years of high-level juniors under his belt. Guptill, who will be 20 this spring, played in 43 games last year for the Waterloo Black Hawks of the USHL. Michigan goaltender Shawn Hunwick missed some practice last week, as did Guptill. The result of their lost time: Hunwick had a career high 46 saves in a 4-0 win over Ohio State on Friday and another 31 in a 4-1 win Sunday. Guptill had two goals and two assists in the sweep. Guptill was named the CCHA offensive player of the week and Hunwick the goaltender of the week. Maybe they should miss practice more often? Not so fast. Michigan coach Red Berenson said it’s not quite time to be resting players thinking of postseason play. Especially considering the team’s more than two-week layoff over the holidays. That’s fine by Hunwick and Guptill, who both say the less rest the better. Both said it took them a while to find a rhythm in the weekend series. Michigan entered last weekend in seventh place in the CCHA standings, trailing Ohio State by 11 points. After a weekend sweep, the Wolverines are in third, five points off the lead. Berenson said there’s no use worrying about where they stand with 10 league games left to play and nine of 11 teams within nine points of the top. Thu, Jan 19, 2012 : 4:45 p.m. I'm really loving the renewed focus of this team. That top line is playing lights out, and you have players like Moffie and Bennett who are coming on at the right time. The boys are skating hard, passing the puck perfectly, and outworking the other team in the offensive zone. Not to mention, Hunny has been a brick wall, and the special teams are making some progress. How does 22 straight NCAA Tournaments sound? Beat the Irish! Thu, Jan 19, 2012 : 1:53 p.m.
Hey Pete, you mention they play the #6 team in the country at Compton Family Ice Arena but for those of us casual fans you might want to mention which SCHOOL they play? It's Notre Dame, btw. Thu, Jan 19, 2012 : 12:57 p.m. I guess even being in the top 5, Ohio is no match for Michigan. Michigan and Ohio are competitive in football and basketball, but don't even try with hockey. UM is the best. Period.